I don't know whether you ever get hooked on a particular stitch, but right now I find myself immersed in the many possible variations of Abi Gregorio's Drop Stitch Cowl. It's a really simple pattern - I've seen it repeated in lots of places - and even though it's written for super bulky yarn it's not hard to adapt it to any weight you have handy. If you make this cowl pretty roomy, it's okay if you don't use the softest yarn in the world; it's very effective as a warm textured necklace over the collar of a blouse or even a turtleneck. And this stitch? It's such a great showcase for yarn. but afterward is another story. In a solid, you notice the stitch. In a stripey yarn, you maximize the impact of the stripe while introducing a ton of texture. I mean, you've got all the little waves of garter stitch, and the horizontal bands the garter stitch creates, and the smooth vertical lines of the drop stitch too. And, after you've blocked it - in a handspun yarn, WOWZA. 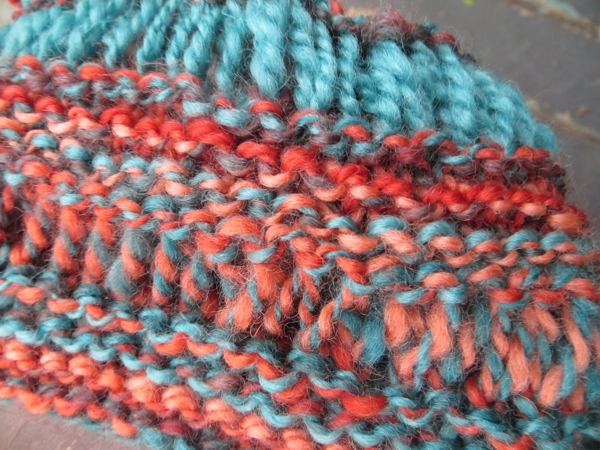 There are situations where it wouldn't work - a drop stitch hat would be pretty chilly I think, and a drop stitch shawl would catch on everything. Let's not even think about the cartoonish drop stitch socks that just popped into my head - those are crazypants. But a cowl? So awesome. And so fast! Four to six hours, and you've not only got somebody's gift done, you've emptied out some serious stash just in time for somebody to put yarn presents under your tree or beside your cake. It's like a magical pattern from a distant fairy-tale land or something. 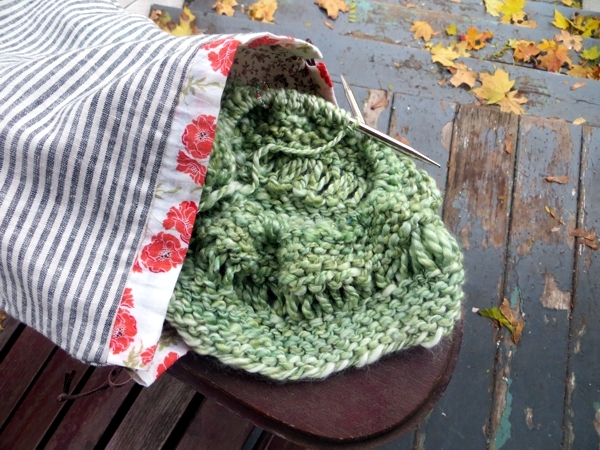 Overall: I find the drop stitch cowl just... super addictive. Do you have a favourite stitch or pattern to share? As you know I like things super-easy these days. I made a wash cloth using the Bee Stitch and it was really fun and super-easy and a little bit of magic. I made a fun cowl for my mom's birthday in September called the Sanibel Cowl. It was super-easy and very easily customizable. 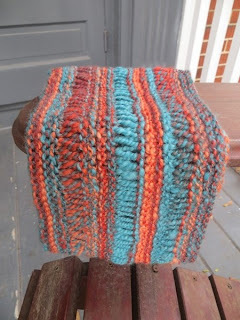 Cowls are just pretty awesomely addictive. Period. Thank you Leslie and Mary for the cowl pattern suggestions!!! I have been searching for an idea for a gift idea for a friends daughter, one of these will totally work!! Off to search through my stash for the perfect yarn to use!! The pattern says to cast on 121 stitches onto a 16 inch circular needle. Is this an error or can 121 of Sanibel yarn really fit onto this size needle? Anonymous - I'm not sure which pattern you mean? 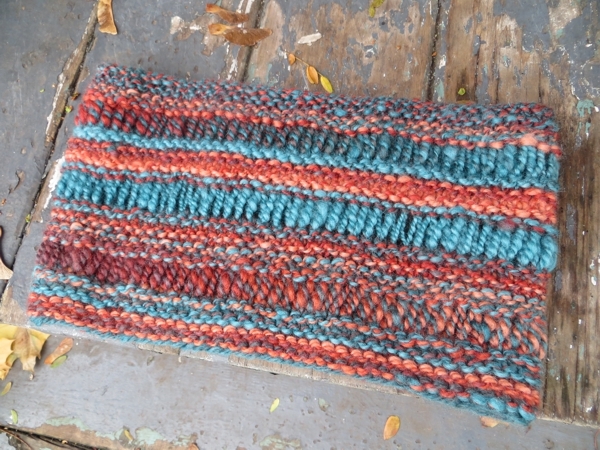 the drop stitch cowl isn't one of mine, but it only calls for about 46 sts (and a 20" circular needle.) I'm usually able to cram a lot of stitches onto a 16" needle for a hat, though, if that helps! I love this stitch too! 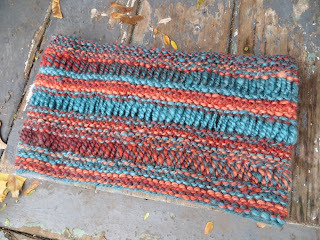 I discovered it online and am making lots of cowls in it. 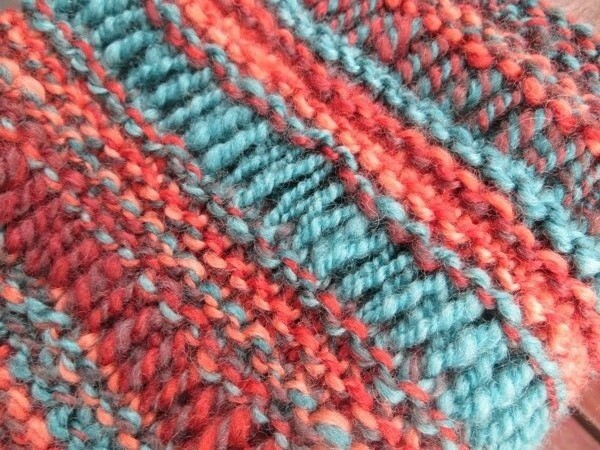 I love using self-striping yarns in this stitch, or a single colour yarn with good stitch definition. You can see my work on my site at tobydesigns.strikingly.com let me know what you think. Thanks for your blog.